A Gorilla Trek is a highlight of all visits done in Uganda and Rwanda and certainly mountain gorillas are the major reason as to why very many people visit these 2 destinations Find information about gorilla trekking holidays to see gorillas in the wild, how to acquire a permit, as well as tour companies arranging such treks. When To Go To See The Mountain Gorillas In Africa? Although tracking mountain gorillas can be conducted all year round in these two countries (Uganda & Rwanda) due to the somewhat damp seasons experienced by the national parks in which these gorillas stay, the majority of tourists prefer visiting from June to September as well as from December up to February.You can visit Bwindi at any time of the year, the low season calls for cheaper gorilla permit price. Which Company Should i use for Gorilla Trekking ? Among credible companies, include, Insight Safari Holidays, specialists in mountain gorilla tracking, Wild Whispers Africa, as well as Kori Safaris. See here a more comprehensive list of safari companies or travel agents. How much does a Gorilla Safari Cost? Of course, various tour operators will give you quotes, roughly the cheapest gorilla safari should have a price of about $ 1000 of course depending on the number of people. The super luxury should be cost you between $ 4000 to $ 6000 per person. Based on reviews of most tour operators in Uganda, most tourists prefer the mid-range, not so budget, but affordable. Booking your safari during the low season should get those costs lowered! In Case you are not interested in Uganda, Click here for Rwanda Gorilla Trekking or Congo Gorilla safaris, otherwise, proceed with the rest of the article. This is quite a tricky question since they are all mountain gorillas living in the forests! Almost same environment. Comparing Uganda to Rwanda is not a good idea since Uganda has more wildlife than Rwanda. Besides the mountain gorillas, you can visit Murchison Falls, or see other primates in Kibale Forest National Park. If its about the cost, please note that, Gorilla permits within Rwanda were recently increased up to $1500 per individual and then in Uganda they go each for USD 600. The permit offers you one hour with the mountain gorillas in a group of 8 people. In case you are threatened by the price look at it in this point of view that you are contributing to the conservation of mountain gorillas and as a form of thank you, you will be rewarded with an hour in the midst observing and enjoying their company. Keep in mind that just 80 people are allowed to see the gorillas in their natural habitat each day. Because their habitat is very fragile, every time you walk in this forest you leave a footprint. Within Uganda, Gorilla trekking is conducted in Bwindi National Park or in Mgahinga National Park. But because of the inconsistency of gorillas in Mgahinga, majority of the sold permits are for Bwindi NP. In Uganda, every gorilla permit goes for US $ 600. In the past years, April, May and November used to cost US $ 450.Please note that these offers no longer exist. On a single day, nearly 72 people travel into Bwindi to see gorillas and only 8 people are allowed to see a gorilla family. We strongly encourage you to book your gorilla permit with a safari agent, the most prominent mistake is to book a gorilla family which is far away from your choice of accommodation! The routes to Bwindi and its various regions are often tricky; this is a remote area. If you would like to do the gorilla trek on your own so as to save costs, you might end up incurring more. Safari guides have been trained to help you with this. Important to note is that tour operators in Uganda through their joint organization of AUTO normally buy as much as 80% of the permits for a time of up to two years to the intended date of trekking the gorillas. Each of the member agencies can buy as many as 20 permits in a single month. However individuals as well as those not under the AUTO umbrella can buy at most two gorilla permits every month three months before the intended month of the gorilla trekking when the reservations open on the very-first working days from Monday to Friday of that month. Permits that aren’t sold on opening of the booking days are resold the next day without any limit put on the number of permits sold by a single operator or even individual person. The endangered impressive Mountain Gorillas in Uganda don’t live in any zoo across the planet since they cannot survive in detention and thus there aren’t any known mountain gorillas surviving within zoos. These can only be found and seen in Africa, in just three countries including Uganda, the Democratic Republic of Congo and Rwanda. There are approximately 786 Mountain Gorillas remaining in the world with approximately half of them staying in Bwindi Impenetrable Forest plus the Mgahinga Gorilla Park within Uganda found in East Africa. When you talk about Gorillas imaginative thoughts cross anyone’s mind; with thoughts of Tarzan movies and King Kong. Mountain Gorillas in Rwanda weren’t known about by the western world until 1902. Rwanda then a German colony, Captain von Berenge was mountaineering Mount Sabinyo on the side of Rwanda together with his friends and at 9300 foot-level where they camped, they spotted a group of Mountain Gorillas and there he shot 2 of them although managed to retrieve just one. The victim was a young-male approximately five years of age, not too big at 220 pounds, however larger than all apes the Germans had ever seen. The Bones plus skin were later forwarded to Berlin and there it was acknowledged as a mountain gorilla. Nobody had imagined that gorillas could stay in a high and colder environment than West -Africa. The news of gorillas attracted hunters to the region, especially within Congo and there several Mountain Gorillas where shot and others captured. Actually Prince Wilhelm from Sweden shot fourteen mountain gorillas in an expedition within this region done from 1920 to 1921. The Belgians launched a Mountain Gorilla preservation’s program and later followed the English who did it in Uganda. Within Uganda for several years no one was allowed to receive visitors to see these Mountain Gorillas. Within Kisoro, Walter Baumgärtel was offered permission to establish visits for tourists to his beautiful Traveller’s Rest Inn, a facility where up to date you can stay within Uganda. Baumgärtel wrote an interesting Book “Up among the Mountain Gorillas” which actually is about his personal encounters with the tranquil giant apes in southern Uganda. It is a great book with reference to a man, the attractiveness of the Uganda’s countryside and an inn, and generally about the fascinating Mountain Gorillas and Uganda gorilla safari. Actually Dian Fossey lived there on a frequent basis similar to George Schaller a many other renowned personalities. There are more than seven hundred and eighty six mountain gorillas in the whole world. Uganda hold close to half of their total population, and the majority of them live in Bwindi Impenetrable Forest, whereas the others are found in Mgahinga Gorilla Park, however these at times cross over to Rwanda. Fortunately the Gorillas are growing in numbers because of the protection they are offered from the government of Uganda which also included efforts of the adjacent communities to the parks to whom part of the USD 500 fee of Gorilla tracking permits charged from foreign visitors to Mgahinga as well as Bwindi is offered. Mountain Gorilla Trekking, How do Gorillas look like ? Mountain Gorillas possess longer plus darker hair compared to their lowland counterparts because they stay in colder climates and higher altitudes. Their life span is between 40 and 50 years. The mountain gorillas mainly stay on the ground although they will climb a tree occasionally given that it can support them, however just like children, their young play in the trees. A fascinating fact is that Gorillas plus Humans are share 98% of their genetic composition. How Do Mountain Gorillas Feed ? Uganda has two places where these Mountain Gorillas may be seen, one is Mgahinga Gorilla Park; a stunning park and a component of the Virunga chain of towering volcanoes that extend into the DRC and Rwanda, and then in Bwindi Impenetrable Forest National Park. Bwindi Impenetrable Forest supports the hugest Population of Mountain Gorilla. It is a ancient forest also called the “Place of Darkness.” The tree cover makes it very dark within this forest. The forest’s altitudes are between 1,160m and 2,607m above sea level. The Bwindi plus Mgahinga each possess varying characteristics as well as similarities. The Bwindi isn’t an extinct volcanic region while the Mgahinga is. Mgahinga Gorilla Park sits on higher altitudes and the Mountain Gorillas move up and feed on some of the afro-montane vegetation. Typically Mountain Gorillas eat large quantities of flowers, leaves, fruit, roots, bamboo and shoots in season. The Adults can consume up to 75 pounds each day. The day of a Mountain Gorilla starts at 6 am up to 6pm with a snooze around lunch time. Uganda receives Light just past 6 am and darkness falls around 7pm. These move every day to different locations where they make nests using twigs plus leaves and spend their night. Some people have found these reasonably comfortable, just enough to actually slumber in. Are Mountain Gorillas Dangerous Species? Will the hurt me during the trek ? Visitors into Bwindi Impenetrable Forest frequently inquire if mountain gorillas are dangerous? Although dominant and very strong, these are gentle as well as shy, and in addition the mountain gorillas which visitors see within Uganda have been habituated. In other words they are habituated to people, which process that takes close to 2 years. Dian Fossey actually was against the idea of visiting mountain gorillas which is done today, however it’s the money collected that survival of this endangered species, and seen their number increase over the recent years. While mountain gorillas are threatened they do attack so as to protect their very own. When different Mountain Gorilla groups meet, there is a fight between the leader Silverbacks to death. Recently 2 Silverbacks fought within Democratic Republic of Congo and the rangers had to intervene. Mountain gorillas exist in groups which differ in size from 2 – 30 or 40, however commonly in groups of 10. There is no specific mating season while babies are born through the year. The Males begin breeding at around 15 years while the females start giving birth between 10 and 12 years. Females can give birth after every 2 to 3 years giving birth to 4 – 6 offspring through their lifetime. Males leave their group at about 11 years of age, while a little over half of the females will leave their group. The supreme threat to the Mountain Gorillas is human encroachment for settlement around them. previously there was a slash as well as burn mentality however, through an educational progrm by the Uganda Wildlife Authority plus cash motivation to the community through the tourism industry that the gorillas within Uganda are today no longer as threatened by various poachers as it was in the DRC. Additionally they are threatened by various diseases transmitted by human visitors into the park, and for that reason the Uganda Wildlife Authority has set up strict rules to prevent spreading of such diseases. Where Can I See Gorillas in Africa? You can see gorillas in Uganda, Rwanda and Congo. However, note that gorillas are mainly divided into the mountain and the lowland with a couple of other sub-species in that. 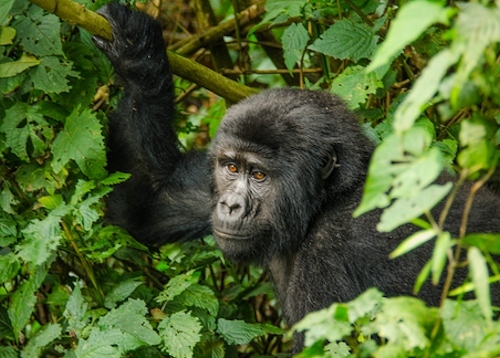 We suggest Rwanda, Uganda for views of the mountain gorillas and the Republic of Congo for the lowland gorillas. It is also possible to find mountain gorillas within the DR of Congo however due to the instabilities within the country, it has been challenging in some areas. Some tourists think that you can find gorillas even where you opt for safaris in Tanzania ! This is wrong. However Tanzania, Uganda and Kenya can be a great addition to your safari tour. Generally, the lowland gorillas are smaller and have brownish-gray far coats and a distinct brow ridge, whereas the mountain gorillas are larger with darker black coats. The Mountain gorillas are the most uncommon primates in the entire world with less than 800 surviving in the African wilderness. on the contrary there are more than 100,000 lowland gorillas just in the Republic of Congo. What do you mean by “On a single day, nearly 72 people travel into Bwindi to see gorillas and only 8 people are allowed to see a gorilla family.”? Do you mean that only 8 people see the gorillas per day? i did track the congo gorillas since they are the cheapest. There you. Everything you might need about Gorilla safaris in Uganda. Book now for the low season with discounted Gorilla permits. Rwanda low season gorilla permit costs $750 while Uganda low season costs $ 350, a difference of 400 dollars!!!! True low season gorilla tracking permits for At $350 per permit for foreign non-residents, expatriate residents at $300 and Ugandans or East Africans at 150,000 UGX are on for this November. Tailor-make your dream adventure in the impenetrable jungle of Bwindi this November with possible extension to Lake Bunyonyi, Queen Elizabeth National Park, Lake Mburo National Park and Kibale National Park with Destination Gorilla Tours Limited, Uganda. For more write to us on dgorillatours@gmail.com or call +256706276529. I am inquiring which area is best to track gorillas? am always doing these gorilla transfers from kabale ,kisoro.even from rwanda. our transport charges meets all travellers budgets depend on your demand. always looking forward for your bookings for these transfers.thank you. Thank You for all the information of Gorilla Trekking, staying there suitable lodges and the travel details and also the clothes at the time of trekking because it becomes cold while we go at the top of trekking. I love primates, how i wish Bwindi had oratugans as well as lemurs. These primates make Madagascar a famous place. Uganda with these two would be very very far. Are there special discounts for gorilla trekking in 2014 ? what is the cost for tracking the gorillas in Bwindi this year? send me more info on gorilla trekking. thanx for the wonderful work such a blessing..
beautiful but sad looking ….